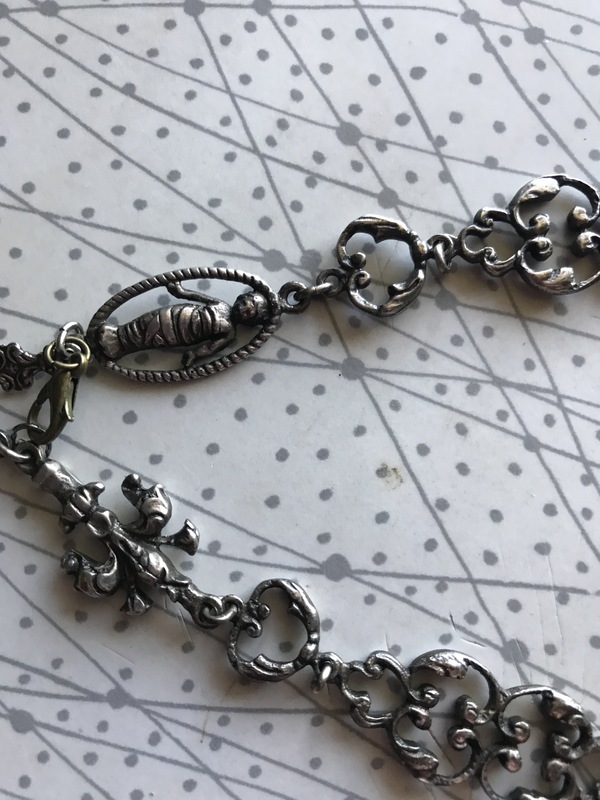 The chain that I have it on is equally interesting but did not come with the pendant. I am told that it is may come from Florence Italy and have found a similar chain on Pinterest. 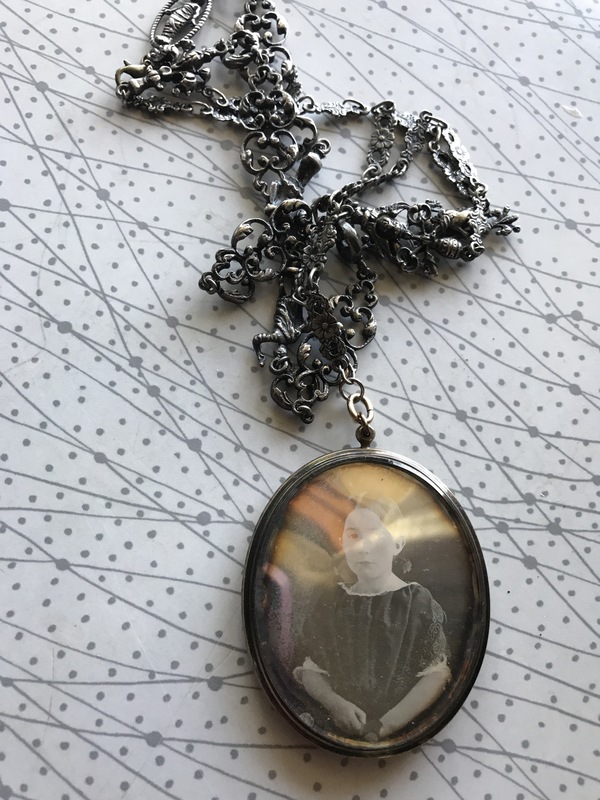 To me the young girl in the pendant was loved and lost by those who must have been family. I cannot imagine a Victorian family unless they had a friend who could create these pieces and/or some money create this elaborate piece. In the first picture below, you can see a lock of her hair in the glass. In the second picture, where you see the memorialized girl, she seems sad and wistful although I know it was not considered appropriate to smile in pictures in that era. The last picture of the chain shows some of the figures on it including the mummy. 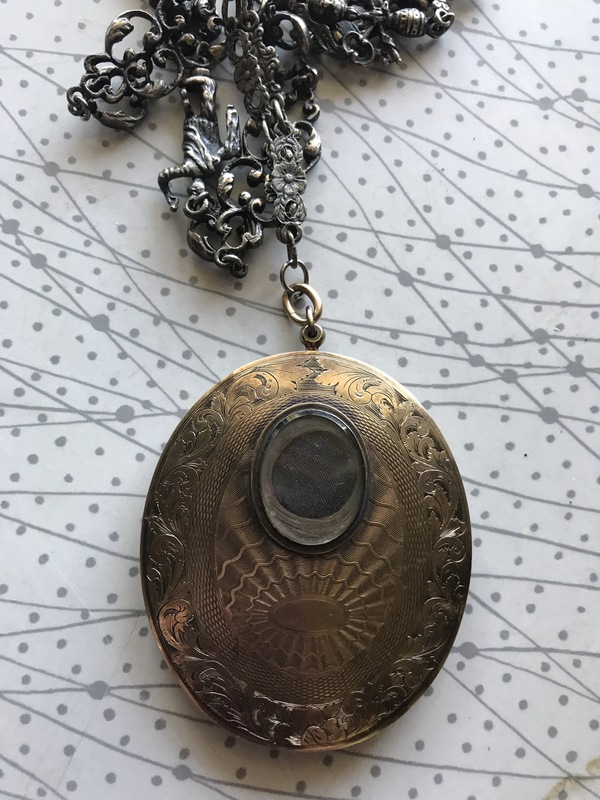 This pendant and chain were in my mother in law’s Jewelry box. My sister in law does not recall seeing this nor does my husband. I inherited these things over 15 years ago and put them on a shelf in my closet. For some reason about 3 years ago I took the jewelry box down and found her. I felt an instant connection and have kept her close since then. I’m still unsure of her nearly everything about her, although a colleague I studied with told me her name was Anna. Have any of my readers ever seen similar pieces?